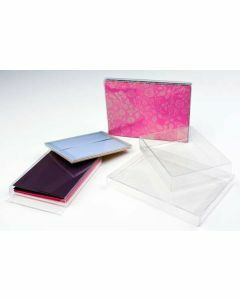 Premium Clear Boxes are protected with a scratch resistant coating to keep your packaging looking nice. The premium finish extends and ensures the best protection and promotion of your products. Our Premium Clear Boxes are coated with a special scratch resistant finish. This extra protection against scratches and scuffs helps to maintain a premium look through shipping and handling, as well as in the retail store environment. Stickers are included, to purchase additional stickers click here to see our full list of sticker options.